We spent a week cruising from Venice. It was an easy way for the everyone to be entertained and fed and a terrific way to take in some more cultural experiences in Europe. Dubrovnik, Croatia was such a pretty port to arrive at first. James, Patrick and Pippa couldn’t really imagine what to expect and the quaint old walled city of Dubrovnik really set the benchmark high for the remaineder of our stops. It was quite a hot day making he steep, narrow steps a challenge for Pippa but it was so pretty and different to anything else they have seen before she persevered. We had lunch in the square alongside market stalls that we discovered were part of a jam festival. Pippa tasted many varieties of jam from the various stalls and actually chose her favourite stall which turned out to be the 17 times national jam champion! Kusadasi, Turkey as well was a pretty little fishing port but we were there to see the ancient ruins of Ephesus. We disembarked and were hit by the harassment of taxi drivers wanting our Turkish Lira, Euro, or whatever other currency they could get! It was very harassing and off-putting and we ran for cover and Patrick declared he hated Turkey and would never return. Despite that, we did negotiate a good deal and a nice driver took us to Ephesus so we could “whizz through in 40 minutes” and then he would take us to the water park where we could whizz down a heap of water slides -FUUUUUUUNNNNN!!! Too much fun for photos! Ephesus was amazing and the archeology aspect mind blowing but easy enough to imagine what it was like 500BC. Whizzing was a bit difficult due to the slippery Marble Road. The taxi driver had given us a guide book so we could self guide ourselves through the ruins. Obviously the stadium that seated 25,000 people to watch anything from concerts to gladiator games was spectacular and so too was seeing the in tact sculpture of the Goddess Nike; the Goddess of Victory and Success with her wings being the influence of the Nike tick. Did I mention the water park was sooooooooooo much fun? Back in Kusadasi Patrick held his opinion fast after I held onto my money tightly waiting for a slick operator to leave us alone who wanted to take over the pre-negotiated fare and make us pay him (instead of our driver) more! We also had a giggle when Patrick called the bluff of a Grand Bazar trader and insisted he show us that the “Beats” headphones inside the box work just as well has his “demonstration” pair. Of course the genuinely authentically fake ones didn’t work at all! Santorini, Greece was of course beautiful. A white washed village atop steep volcanic views with spectacular cliffs overlooking the blue Agean Sea. Once again we enjoyed strolling the cobblestoned streets and had lunch at a cafe literally hanging over the blue sea below. I must admit I was a little slack on the photos here because I had been up all night sea sick – I was feeling about as washed out as Santorini! Sea sick tablets from then on and I was much better for the rest of the cruise. Katakolon, Greece was a pretty, colourful harbour side village consisting of one street about 300m long. We elected not to do any sightseeing and instead took a little train through olive groves, farms and a winery to a beach where we had lunch. We thoroughly enjoyed seeing a glimpse of Croatia, Turkey and Greece. The purchase of the week???? Sling shots from Greece…….. 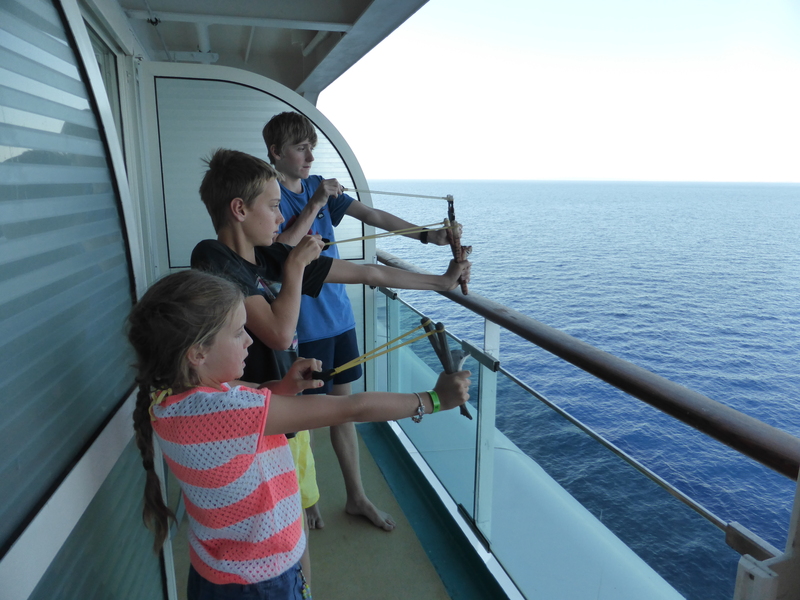 Thank you so much Virginia for the photos and the blog on your holidays. I feel as though I have been part of the holiday. Magic times together.